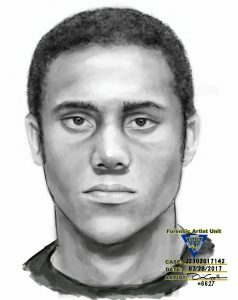 The New Jersey State Police have produced a sketch of a person of interest regarding a fatal shooting that took place in Elizabeth a month ago today, acting Union County Prosecutor Grace H. Park announced Wednesday. The Prosecutor’s Office today is releasing the sketch and re-releasing video surveillance footage depicting a vehicle thought to have been involved in the death of 33-year-old Ricardo Nieto. Elizabeth Police Department patrol units responding to a report of shots being fired in the area of Niles Street and 5th Avenue at approximately 2:50 a.m. on Sunday, July 16 found Nieto in the driveway of his home suffering from gunshot wounds, according to the investigation. He was pronounced dead at the scene shortly thereafter. footage, which was first released two weeks ago, the suspect vehicle can be seen traveling in opposite directions on Niles Street near 5th Avenue about two minutes apart a little after 9 p.m. on the night of Saturday, July 15. The vehicle, a light-colored, two-door car with a sunroof that also may have had out-of-state license plates, is believed to have remained in the neighborhood right up until the time of the shooting nearly six hours later. This matter remains under active joint investigation by the Union County Homicide Task Force, Elizabeth Police Department, Union County Sheriff’s Office Identification Unit, and Union County Police Department Ballistics Unit. Anyone with information about this matter is being urged to contact Homicide Task Force Detective Richard Acosta at 908-347-0404 or Detective Sofia Santos at 908-577-4256.